Co-Optimus - Editorial - Is Exclusive Content Bad For Gaming? 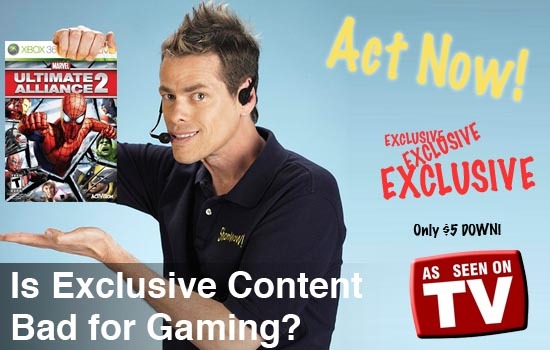 Is Exclusive Content Bad For Gaming? Anyone who pays any attention to video game releases knows about exclusive pre-order deals for in-game content. Until a year ago, that content was a statue, a figure, a hat, or something we'd consider "swag" in the gaming world. That all changed when retailers and publishers started releasing codes for in-game content. It started off as a gold-colored Lancer for Gears of War 2, or a Warthog with flames on the sides for Halo Wars. While these were merely collectibles that changed in-game aesthetics, it has recently evolved to game-altering exclusives. I'm talking about exclusive characters or gameplay modes that could potentially change the experience of the game itself. This list from Arstechnica.com has a brief list of the fall releases with exclusive in-game content. We've updated it a bit. * Halo 3 ODST: Players who preorder the game will receive a code allowing them to play as Sgt. Johnson in the online multiplayer mode, "Firefight." * The Beatles: Rock Band: Preorders will give players three free in-game songs and an in-game photo book. * Marvel Ultimate Alliance 2: Unlock the the Juggernaut as a playable character. * Dark Void: Players will get a gold jetpack, allowing them to use unlimited amounts of boost and pull off as many special moves as they want. * Assassin's Creed 2: Exclusive access to Palazzo Medici, as well as "the freedom to discover the treasure hidden within its ancient walls." * Section 8: Players will receive exclusive captain's armor for when you play as either faction in the game, as well as a special in-game pistol. * Brütal Legend: Exclusive in-game guitar weapon. * Need for Speed: Shift: Access to the BMW E92 M3 GT2 in the game. * Ninja Gaiden Sigma 2: A special in-game Ryu Hayubasa costume. * Uncharted 2: Among Thieves: Players will be given access to the game's multiplayer demo, as well as immediate use of the Revenge Attribute, an unlockable booster in the multiplayer campaign. * Ratchet and Clank: A Crack in Time: GameStop exclusive level known as the "Discovery Pack," giving players a museum-like level containing "a moon’s worth of extra content." * Tekken 6: exclusive Cardboard Tube Samurai costume designed by the guys behind Penny Arcade. It should be noted that while these items are limited to Gamestop purchases, online retailer Amazon, and other retailers also participate in these limited time deals. For instance, other stores are coming up with ways to counter these exclusive retailer/publisher deals. For Halo 3: ODST, Toys R Us was giving out $20 gift cards, and a free ODST action figure. While the action figure, and the $20 gift card were both accessible to non-ODST buyers, it added value to the package making it easier to swallow a $60 investment on a new game. That was the route I went, and while the sting of jealousy for not being able to play as Sgt. Johnson is there, I have a $20 gift card to put toward other games to play. Unfortunately, if this trend of exclusive in-game content battles continues, no gamers will ever have the same experience with their games, creating a gap left for gamers to feel disconnected from one another. Page created in 0.6115 seconds.